Welcome to deploying your XGBoost model on Algorithmia! You’ll want to do the training and saving of your model on your local machine, or the platform you’re using for training, before you deploy it to production on the Algorithmia platform. Host your data where you want and serve it to your model with Algorithmia’s Data API. In this guide we’ll use Algorithmia’s Hosted Data Collection, but you can host it in S3 or Dropbox as well. Alternatively, if your data lies in a database, check out how we connected to a DynamoDB databasee. First, you’ll want to create a data collection to host any data associated with your model and your XGBoost model itself. Log into your Algorithmia account and create a data collection via the Data Collections page. Click on “Add Collection” under the “My Collections” section. After you create your collection you can set the read and write access on your data collection. For more information check out: Data Collection Types. Note, that you can also use the Data API to create data collections and upload files. 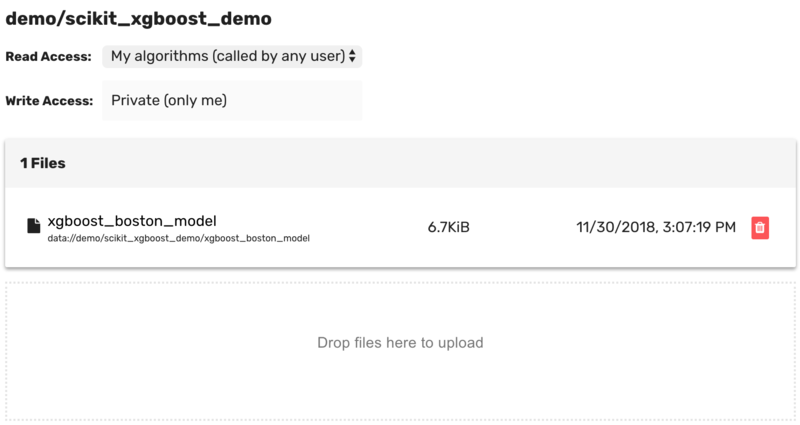 Next, upload your serialized model to your newly created data collection. 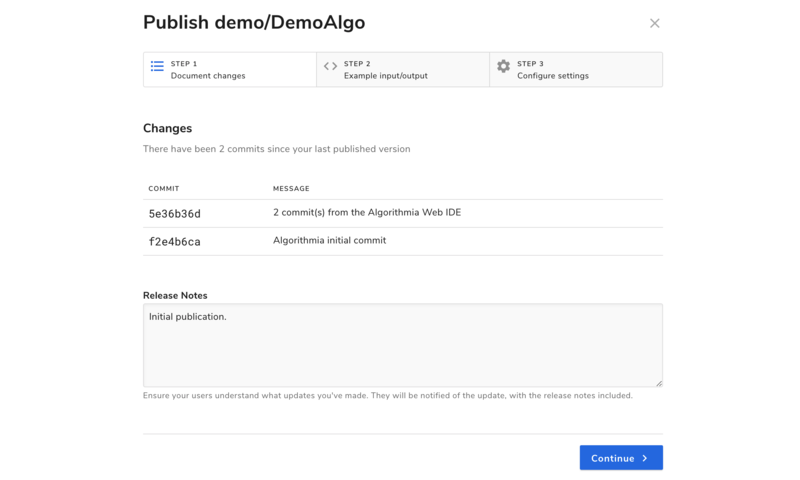 Hopefully you’ve already followed along with the Getting Started Guide for algorithm development. If not, you might want to check it out in order to understand the various permission types, how to enable a GPU environment, and use the CLI. Once you’ve gone through the Getting Started Guide, you’ll notice that when you’ve created your algorithm, there is boilerplate code in the editor that returns “Hello” and whatever you input to the console. Now is the time to set your dependencies that your model relies on. 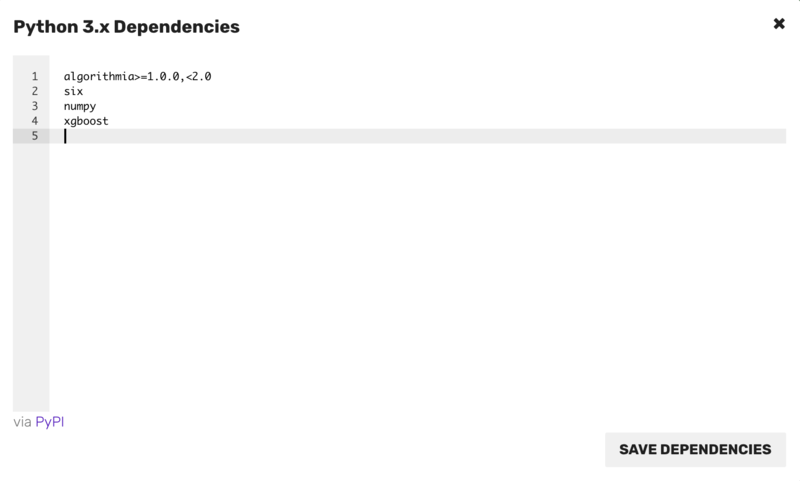 Click on the “Dependencies” button at the top right of the UI and list your packages under the required ones already listed and click “Save Dependencies” on the bottom right corner. Here is where you load and run your model which will be called by the apply() function. When you load your model, our recommendation is to preload your model in a separate function external to the apply() function. This is because when a model is first loaded it can take time to load depending on the file size. Then, with all subsequent calls only the apply() function gets called which will be much faster since your model is already loaded. If you are authoring an algorithm, avoid using the ‘.my’ pseudonym in the source code. When the algorithm is executed, ‘.my’ will be interpreted as the user name of the user who called the algorithm, rather than the author’s user name. Note that you always want to create valid JSON input and output in your algorithm. For examples see the Client Guides. This is where we’ll show how to deploy your saved model to make predictions on the sample data. If you don’t recall from the Getting Started Guide how to go through the process of publishing your model, check that out before you finish publishing. If you want to have a better idea of what a finished XGBoost algorithm looks like loading a XGBoost model, check out: scikitlearnxgboostdemo. That’s it for hosting your XGBoost model on Algorithmia!